With this being the first entry in the series to appear on PlayStation 4 (Correction: This is is third entry to appear on the PS4, after the EDF4.1 port and EDF5. 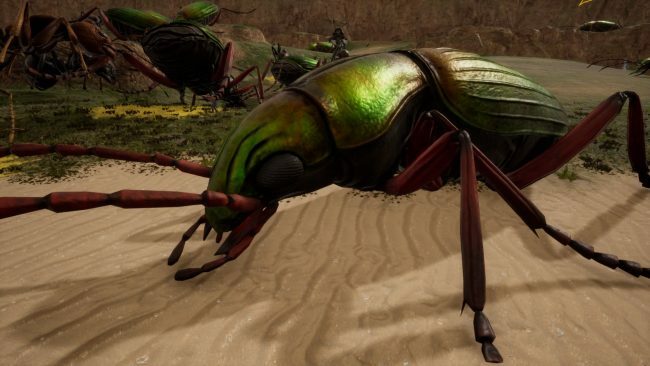 We apologize for the error), you might have certain expectations for Earth Defense Force: Iron Rain. When considering the quality of games that have released this generation, specifically towards the latter half, seeing a mediocre release is particularly striking, comparatively speaking. That’s why it’s super noticeable just how dated and so-so Earth Defense Force: Iron Rain is. The novelty of killing space ants wears off quickly and when you combine that with the repetitive gameplay loop, the “samey-ness” of the soundtrack, and the lack of a hook to draw you in, there is a ton going against Iron Rain, sadly. 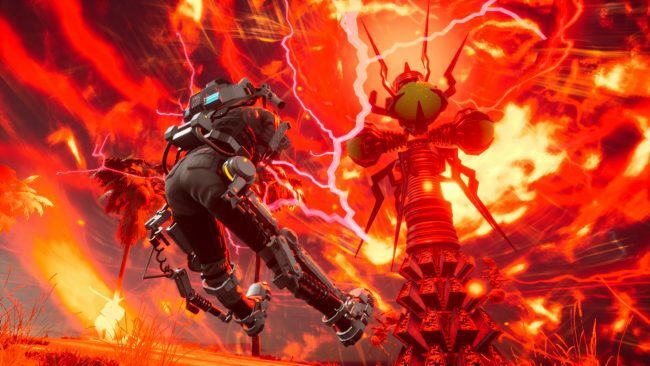 It does have its moments of fun, so it isn’t all doom and gloom, but as our expectations have evolved, Iron Rain seems to be stuck in the past. For those unfamiliar, the Earth Defense Force series has always been about one thing: murdering tons of alien bugs. It’s done so in a cheesy, yet endearing way that always felt arcade-like in nature. In this entry, the same formula appears, only it is laser-focused on pleasing a Western audience. At least, that’s the goal of the D3 Publisher and developer, Yuke’s. For the most part, it does succeed with this goal, in part by adding recognizable U.S. cities like San Francisco, and muting the bright and vibrant colors to appear more serious in tone. It’s an apparent shift that is sure to grab the attention of people here in the states. The gameplay itself remains mostly unchanged, with the focus on using a wide variety of weapons to eliminate hundreds (maybe thousands!) of bugs throughout each of the levels. You have access to different gear, like med kits, grenades, decoys, and other things you’d expect out of an action game. There are also three different classes to choose from, a lightweight class that can essentially fly, a medium build with a balanced move-set, and a heavy class with an emphasis on armor. You can tell there was effort made to diversify the gameplay experience, but the overall feeling is very repetitive and it makes everything blend together. The campaign mode is structured into levels, each with their own objectives. However, this structure feels very outdated. Not that a game with levels is inherently bad, but having to go back to the menu to select the next mission takes you out of the experience and makes you well aware that you’re playing a video game. It’s just not something you really see anymore, as games nowadays are more seamless and do a better job of keeping you immersed. Not every modern game is like this, sure, but most of the memorable titles keep you engaged, so Iron Rain feels like it was developed in a vacuum. That’s sort of the crux of this game: If it were the year 2006, you’d probably have an easier time falling in love with Iron Rain. Once you’re within a level, the objectives are quite bland: Kill x amount of bugs, defend point x, survive for a certain amount of time. Perhaps the very nature of a game about killing aliens lends itself to these repetitive mechanics and formulas, but there has to be a better way to execute on it. After a while, repetition starts to sink in and there isn’t much substance here to keep you coming back. The only thing I can see that would warrant replayability is the upgrade system. When you kill enemies, you get gems that act as a currency that you can use to spend on upgrading your health and purchasing better weapons. But even this feels like an outdated mechanic as there isn’t much else to it besides buying things from the store. It would be neat if there was the option to upgrade different abilities or skills that would fundamentally change the way you play, but alas, what’s here is quite forgettable. 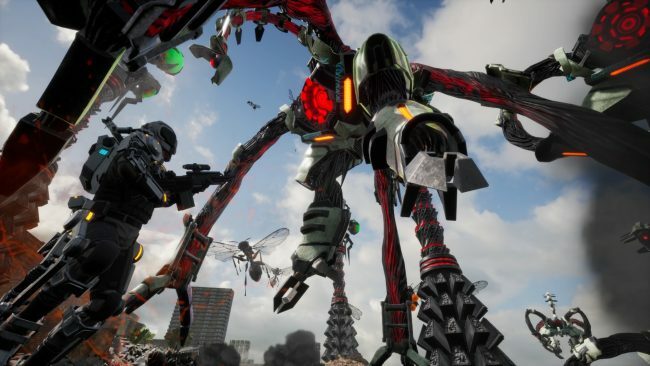 Earth Defense Force Iron Rain Review — A Story Worth Telling? As for the narrative, you’ll likely be disappointed in that department, too. Again, it’s what you’d expect: Save the world from the bugs. That’s it. Perhaps that’s all you’d expect from a game like this, but during a time when there is such an emphasis on storytelling, it’s unfortunate that Iron Rain didn’t explore this further. It wouldn’t have to be the pinnacle of storytelling to win me over, but something better than “save the world” is sort of expected. There are cute moments of dialogue between the characters that might make you smile, but the overall story didn’t do much for me. Repetition is the running theme with Iron Rain, even with the music. The track that plays when you first boot the game up will get annoying quick, since it plays during most of the menus and loading screens. Aside from that, there aren’t any memorable tracks that stand out, which is a shame. It shouldn’t be too hard to come up with catchy music that fits with killing space ants, so here again is a missed opportunity. It’s not all terrible, though. Some of the fights are challenging and fun, and the visual spectacle of taking down an entire building does stand out. And there is something mildly satisfying about shooting a group of bugs with a rocket and watching their carcasses flop around. 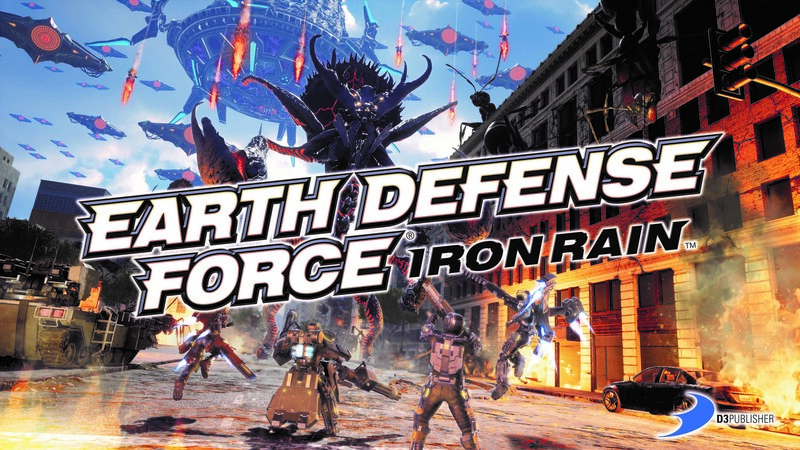 Earth Defense Force: Iron Rain is most successful when playing with other players, which is the recommended way to play. A squad of up to four players can complete the same missions found in the single player mode, but playing this way is a bit more satisfying, as you can more easily obtain gems to acquire more gear. It’s also quite fun to gang up on a gigantic robot or alien as a group, because you can strategize and work together to take it out. This sense of camaraderie definitely makes things more enjoyable. If you’ve already played through the single-player mode, you might be disappointed to learn that there isn’t much of a difference when playing with friends, in terms of the levels themselves. That’s why it’s recommended to just start with co-op from the beginning. Playing with a group will also result in an easier time getting through the levels, as you have multiple opportunities to revive yourself on the fly. While playing solo, you can respawn after death, but you must have a certain item to do so and it’s far less forgiving. The design of the difficulty is odd because it seems to fluctuate very abruptly. Once you get to the fourth or fifth mission, there is a tremendous spike in difficulty and it comes across as jarring. After you die, you must restart the entire mission, which in some cases can set you back up to 45 minutes. Frustration started to set in after dying towards the end of a mission, which didn’t help since the motivation to continue playing was already low to begin with. If you’re a trophy hunter, you might want to consider playing with friends, because it will take a while to achieve the Platinum trophy. Aside from the campaign, there is a competitive multiplayer mode that offers an interesting take on what you might be used to with a typical versus mode. In it, you compete against other teams to get the most points, which are acquired by defeating enemies. However, killing an enemy doesn’t automatically result in points, and you must physically run to where that enemy died to retrieve gems. Grabbing the gems will net you points, so it motivates you to run around and swoop up some points just after an opponent gets a kill. Each round, the enemies get tougher and larger in scale, and I found myself actually having more fun playing the versus mode than the campaign. If you get a group together that knows what they’re doing, there is a lot of fun to be had with the potential of some tense and memorable moments. It would be interesting to see this mode explored more, with maybe a more interesting progression system in place that would motivate for multiple play sessions. As it stands now, the mode is fun, yes, but it’s not enough to warrant playing for hundreds of hours. Even still, don’t skip out on this mode because it’s one of the highlights of the whole game. At the end of the day, Earth Defense Force: Iron Rain feels like it should have come out over a decade ago. There are a few fine ideas and some fun moments, but this kind of game just doesn’t hold up when there are so many other fantastic titles releasing so frequently. It’s not a bad game, but time and money are limited, so I can’t recommend Iron Rain unless you’re a die hard Earth Defense Force fan, or if you can manage to get it for a great price, sadly. If you’re wanting an in-depth co-op experience with a deep progression system and a memorable story, you’ll have to look elsewhere. 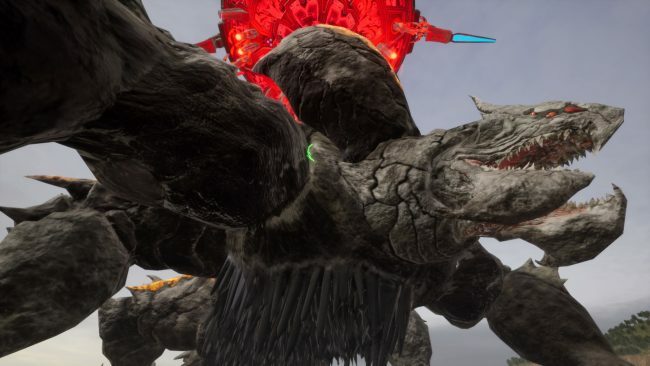 For more on Earth Defense Force: Iron Rain, check out our interview with series producer, Nobuyuki Okajima, where we discuss the series and more. Earth Defense Force: Iron Rain review code provided by publisher. Version 1.00 reviewed on a standard PS4. For more information on scoring please see our Review Policy.